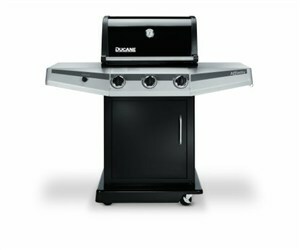 Ducane's Affinity 3100 Natural Gas Grill hooks up to a permanent natural gas supply line, so you'll never need to bother with setting up LP tanks and trading the empties in for new ones. The Affinity 3100 gives you all the flavor and convenience of outdoor grilling without the heavy work. Three individually controlled burners create a maximum of 36,000 BTUs over the 418 inches of cooking surface. Porcelain-coated stainless steel reflector plates over the burners radiate the heat evenly to the porcelain-coated grid above. The grid and plates clean up with a stainless steel wire brush and carry a three-year warranty. Fuel lines to the burners end in spider-blocking mesh, so you won't need to worry about nests blocking the pipes in the springtime. Other handy perks include a built-in thermometer in the grill hood and a dependable battery-powered electronic ignition. Sized for the couple or the small family, the Ducane Affinity 3100 includes a wrap-around shelf with no extra burner outside the cover. Many find the extra space more useful than an extra burner. Inside the stainless steel cover is a small warming rack of welded stainless steel rod, good for heating up buns and keeping cooked food warm. Notches in the cabinet sides accept a rotisserie, but that's not included with the basic grill. A throw-away aluminum pan fits neatly below the burners to catch excess grease -- remove the pan after every cookout and be sure to replace it with a fresh one. In between uses, protect the grill with a rain-proof cover, because the cabinet isn't weatherproof.